So, when I asked you good folks in Brisbane NOT to do anything cool or interesting in the next 4 monthes, apparently it fell on deaf ears. Not only has there been the opening of Brewski Bar in Caxton and the brewing and upcoming tapping of the Bacchus Beer Bloggers series, now a new face pops up in the Newstead area aptly named “Newstead Brewing Co. It’s quite clear that you all hate me. Newstead Brewing Co is opening their doors this Saturday at 85 Doggett Street (which according to Facebook is 13052.1 km from where I currently am) to the general public. They opened up for a few hours on Wednesday and all the reviews I’ve been seeing are positive. I was able to get a hold of Mark Howesfrom Newstead and was able to ask him a few questions. What is the story behind Newstead Brewing? During the dismal abyss that some people call academic research my wife decided that I needed a hobby to improve my work/life balance and to have a bit of fun so she bought me a home-brew kit from Brewers Choice. When I realised that brewing beer is just as sciencey as science with much better outcomes I was hooked. Every year I would add bits and pieces to my kit until it got to the stage where I was kicked out of the kitchen and into the garage with an all-grain two-vessel 0.2hL brewhouse. Years latter brewing is now my vocation, so looks like my wife’s good intentions backfired a bit. My folks, Peter and Heather, started their own small HR consulting firm in 1982. After tireless hard work and twenty years later it was sold to the global leaders in workforce planning. Looking for some investments and tired of my whinging about the vagaries of research they began toying with the idea of opening a craft beer bar. Talking to a good friend and restauranteur, Michael Conrad, at the same time, who was also interested in trying something new, the plan started to take some shape. After thinking about it for a while, Michael figured it would work better as a fully fledged microbrewery, bar and restaurant. About this time I was half way through the Grad Dip of Brewing course offered at the University of Ballarat and was getting more and more passionate about brewing. Since then we have adhered strictly to the Newstead Brewing ethos, which is pretty much “the best decisions are made post hoc”. What was your biggest challenge, from getting started to opening, that you have faced? Its all been a little challenging but a hell of a lot of fun too. Dealing with all the forms of government is not high on my “things that are straightforward and conducive to supporting and growing small business” list. What excites you most about opening in Newstead? Getting to see Brisbanites enjoying local, fresh beer. Do you have any big events planned to kick off the grand opening? Not at this stage, we just want to keep things simple. We want the venue, restaurant and beers to talk for themselves. What is your definition of “craft beer”? Brilliant question. My personal view is that craft beer is a philosophy to producing a quality beer without compromise. Can massive commercial breweries make craft beer? Absolutely. It does not matter what system you have, if you invest creativity and quality materials with time and perseverance anyone can make a craft beer. Craft beer is definitely not adjunct and preservative riddled dribble tarted up in “craft” packaging. Of your beers on tap, what is your personal favourite and why? Probably the pale. Its not a stand out beer or even a great pale but I have always struggled to make a good pale at home. For me, making balanced beers is more difficult then hop bombs or big barley wines. What advice would you give to up and coming brewers? Above all, you need perseverance. Don’t be afraid to chuck bad beer and don’t give up. It takes time and effort but the satisfaction from nailing a beer and making it exactly how you wanted is worth it. Science’s loss, Brisbane’s gain! 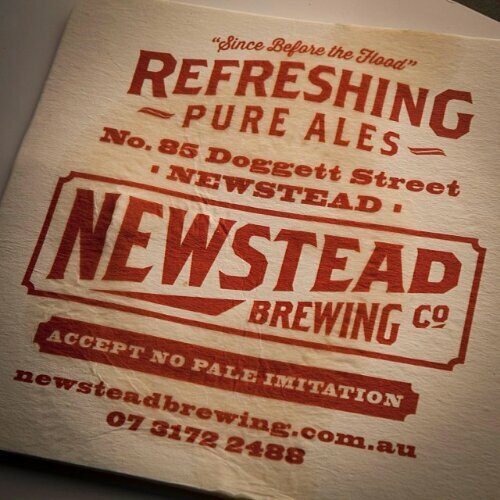 Newstead will be firing up the taps with 7 regularily brewed beers and have roational single batch brews. With a line up that includes an Amber, Golden, and Session Ale, as well as a Pale Ale, IPA, Cider, and a Porter, there is a bit of something for everyone. With a food line-up thats looking better and better with each delicious photo they put on their Facebook page, I can see this being a regular hangout. 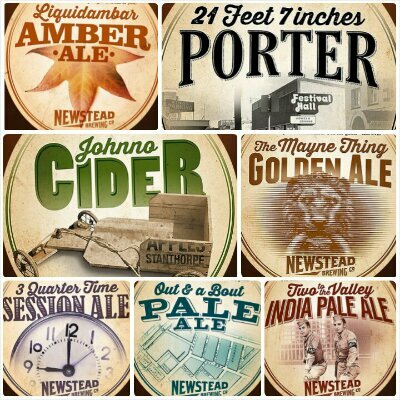 You can get more updates on whats going on with Newstead on their Facebook page, via their Twitter at @NewsteadBrewing or via their website. I accept this proposal. I just expect to see photos of two of each beers with myself tagged in.